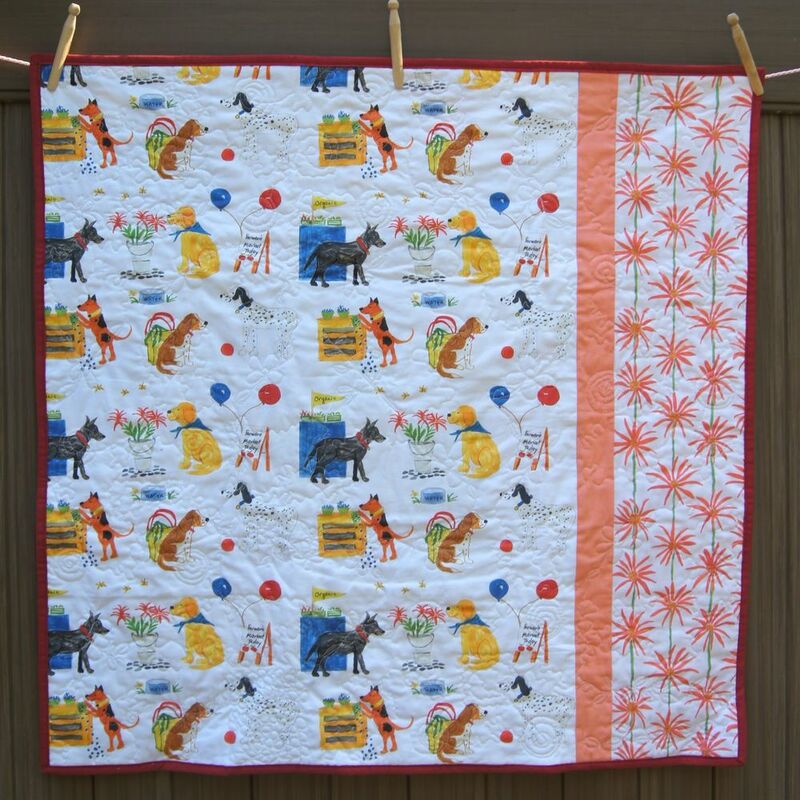 Here are a couple quick projects using the fabric I designed, "Dogs at the Farmers Market" available from Spoonflower.com. I've listed fabric requirements and cutting directions but not sewing instructions. Scrap of quilt batting 14.5 x 36 "
I assembled my table runner by the Quilt As You Go method, but it can be pieced any way you prefer. If not using this method, piece the blocks, sandwich the table runner and quilt as desired. Make a binding from the strips and sew it onto the table runner. Enjoy! Here is a 9 patch block using 5 x 5 inch squares. This block finishes at 13.5 inches. This could be one block in a quilt. 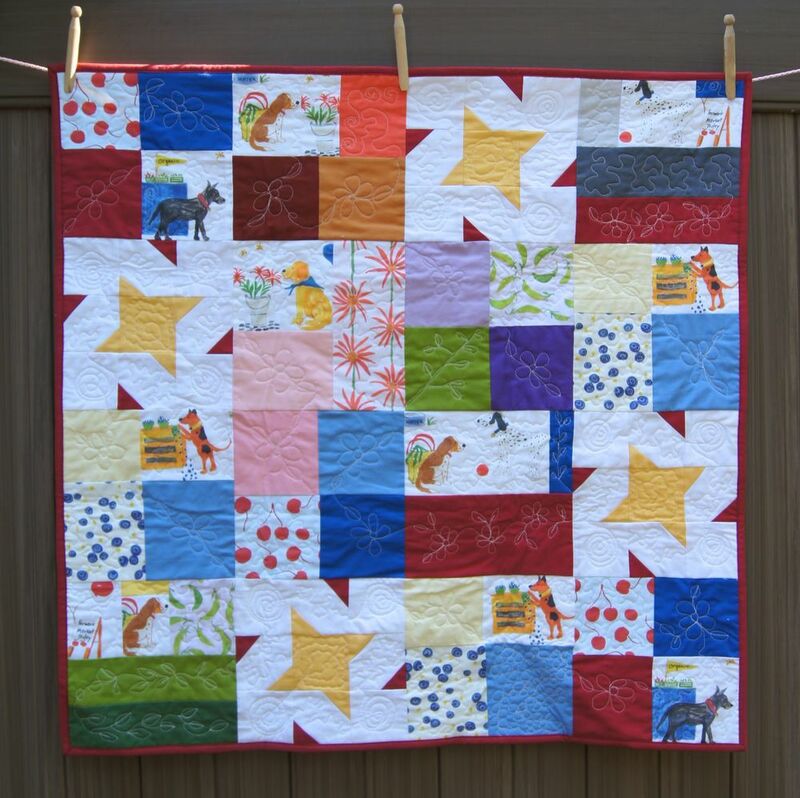 With a single Fat Quarter of the Paired Springers and Golden Retrievers you will be able make another block like this one using just Springer Spaniels or you could make 3 blocks mixing up the Springers and Golden Retrievers in each 9 patch blocks. I used my 9 Patch Block to make a pillow cover, using red ric-rac as a detail. Like the block, it finished at 13.5 inches, an odd size for a pre-made pillow form. But a 14 inch pillow form with some stuffing removed works just fine!